Considering the unprecedented development of the art market over the past few years which has resulted in the ‘financialisation’ of the ART market, Art is now seen not only as an object of pleasure but also as a new alternative asset class with interesting business opportunities. We aim to employ digital technology to explore the potential impact on the art and finance industry, whilst addressing key challenges such as Marketplace Visibility, Transparency, Liquidity, and Valuation. Furthermore, we aim to create a platform for discussion to inform and drive developments in the art and finance industry, whilst fostering direct and indirect art and finance related activities in Africa. 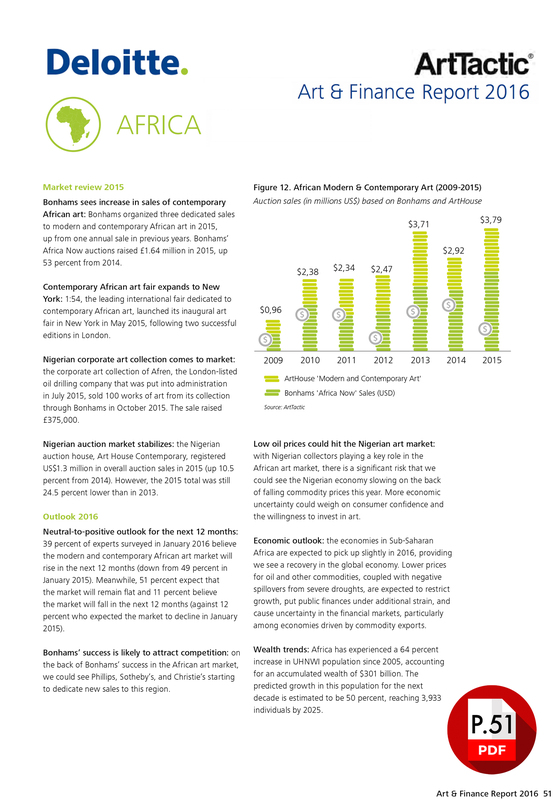 The 2016 Edition of ART & Finance Report by Deloitte Luxembourg and ArtTactic highlight that the Modern & contemporary African Art Market is starting to build momentum and critical mass. But with critical mass comes responsibility and the need for rules and frameworks to ensure that the industry is built on solid foundations. The challenges are many, and the need for a coordinated response across all market stakeholders is now required. From our research in Lagos, some basic independent ‘In-gallery ART Finance plan' does exist within a few galleries, however lacking the defining structures to ensure sustainability and growth. Thus, we are soliciting for finance establishments, Banking and Legal services providers to work with ARTMAZON™ to put in place the adequate framework and Legal structures to implement an ART Finance plan to this effect. By providing robust ART Finance plans for the acquisition of Art on ARTMAZON™ we would be facilitating a sustainable relationship between two intertwined industries and creating the choice Marketplace for the promotion of Modern & contemporary African Art. Inline with increasing volatility in global financial markets and a changing wealth management environment, wealth managers are forced to look beyond traditional investment and wealth management products. At this point, we are certain that an investment in ARTMAZON™ and its associated Finance structures or both are feasible. We invite interested market stakeholders to further articulate our unique value proposition and to identify collaborative partnership opportunities towards our mutual advances and benefits. Ultimately our aim is to put ART in its rightful place as a potent resource for youth empowerment, socio-cultural and national development, whilst promoting Modern & contemporary African ART on a global platform.